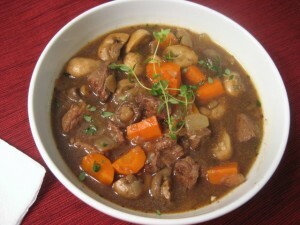 Beef Stew recipe by N.s. Nasim at DesiRecipes.com. This is spicy, but not 'hot', (note that the only 'hot' spice, cayenne, is optional....) and a different change of pace from everyday beef stew. You could also use lamb in place of the beef. Put the ginger , onions, and garlic into a blender container, and blend to a paste, adding a Tablespoon of water if necessary. Set aside. Put the peppercorns, cloves, bay leaves, and cardamom pods in one bowl. Put the ground cumin, ground coriander, cayenne and 1 teaspoon of the salt in another bowl. Put the yogurt into another bowl. Put the remaining teaspoon of salt into another bowl. Now, heat the vegetable oil in a large dutch oven. When hot, put in the peppercorns, cloves, bayleaves and cardamom pods. Stir for a second. Now put in the onions, garlic , and ginger . Stir and fry until the paste starts to develop brown specks. Add the ground cumin, ground coriander, cayenne and 1 teaspoon of the salt . Stir together, then add the meat. Stir and fry for a minute. Next, add the yogurt 1 teaspoon at a time, until the yogurt has been mixed throroughly with the other ingredients. Keep on frying until the meat has a slightly browned look. Add the spinach , bit by bit, stirring in more as the spinach in the pan wilts. Keep stirring and cooking until the spinach wilts completely. It should give up its juices, to cook the meat. Now, put the entire mixture in the crockpot, and allow to simmer for 6-8 hours on high or 8-10 hours on low, until meat is tender. When done, sprinkle the garam masala over the meat, and stir in, then simmer for about 5 minutes longer. If there is too much liquid, simmer uncovered for 5-10 minutes until sauce is thicker. This is usually served with flatbread, but is good over rice or noodles. Meat will cook in its own juices as it is mentioned in the recipe. Do you add any water or is it going to cook in its own juices for 10 hours?